Going strong since 1984, Nu Skin distributes more than 200 premium quality anti-aging products in both the personal care and nutrition categories worldwide. Having over 550,000 distributors spread throughout the world, and no fast or easy way to manage the marketing needs of every one of them, Nu Skin was running into a problem. Nu Skin didn’t have anywhere to turn to for help until Divvy by Alexander’s came into the picture. Headache and stress are eliminated, and the Nu Skin brand stays intact. Divvy by Alexander’s helped Nu Skin distributors streamline their marketing needs with one easy online solution. 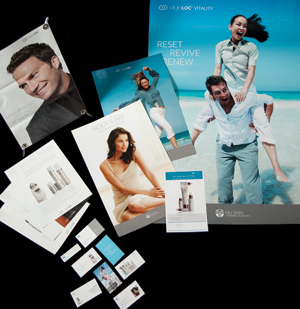 Divvy made Nu Skin 117,000 individual printed pieces, and shipped them out each month to distributors around the world. Divvy provided 24/7 ordering capabilities for 550,000 Nu Skin distributors.